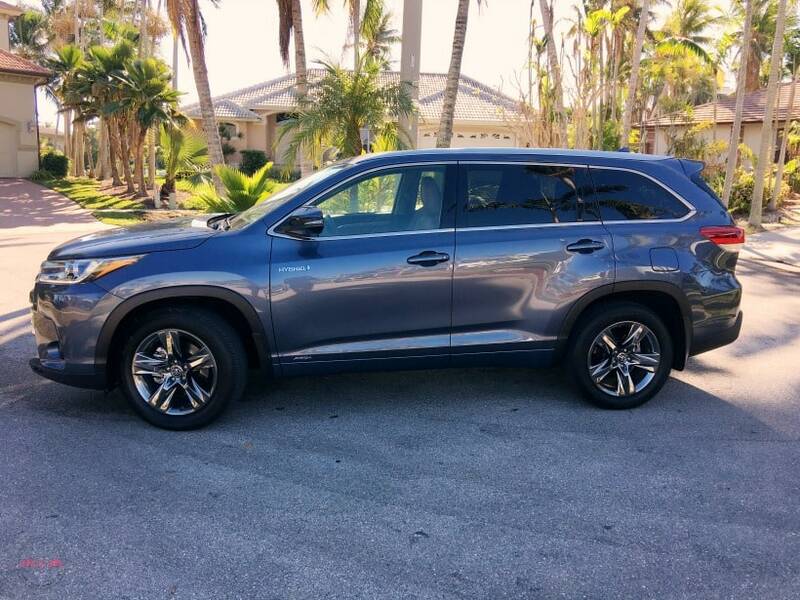 If you’re on the hunt for the best family SUV, the Toyota Highlander may be just right for your family. I’ll show you all the features it has to offer families and why we fell in love with it. 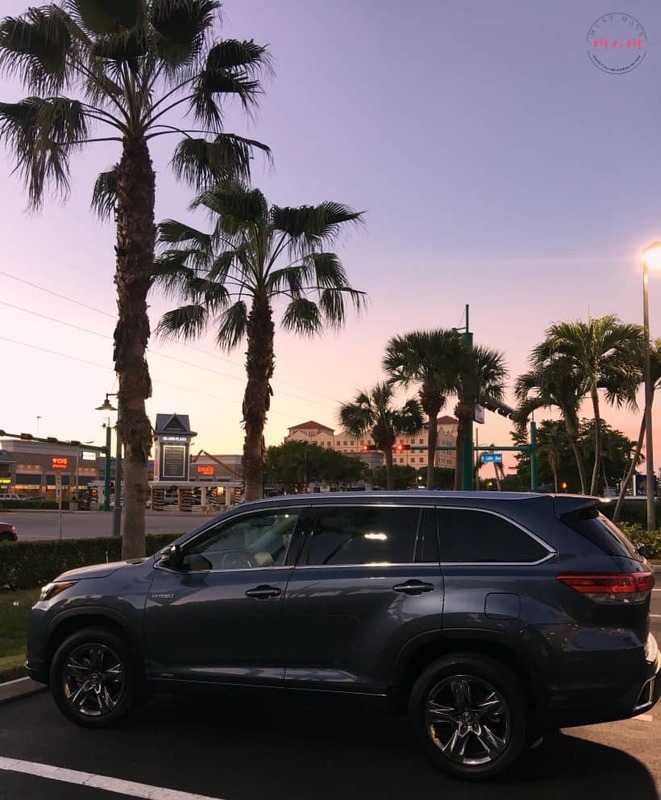 We had the opportunity to test out the Toyota Highlander on our recent vacation to Florida. 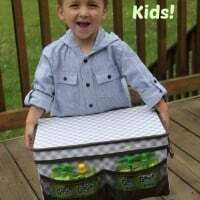 I couldn’t wait to check out the features it had and see how it would work for our family. 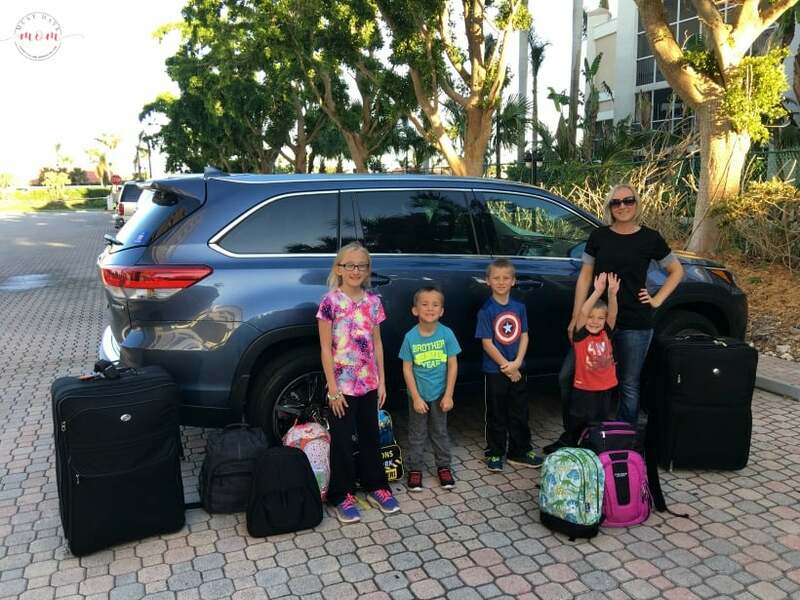 Now keep in mind that we are a family of six, two adults and four kids, so it’s a lot to ask of a midsize SUV to host us on vacation. Spoiler alert, I wasn’t disappointed in its size or features! 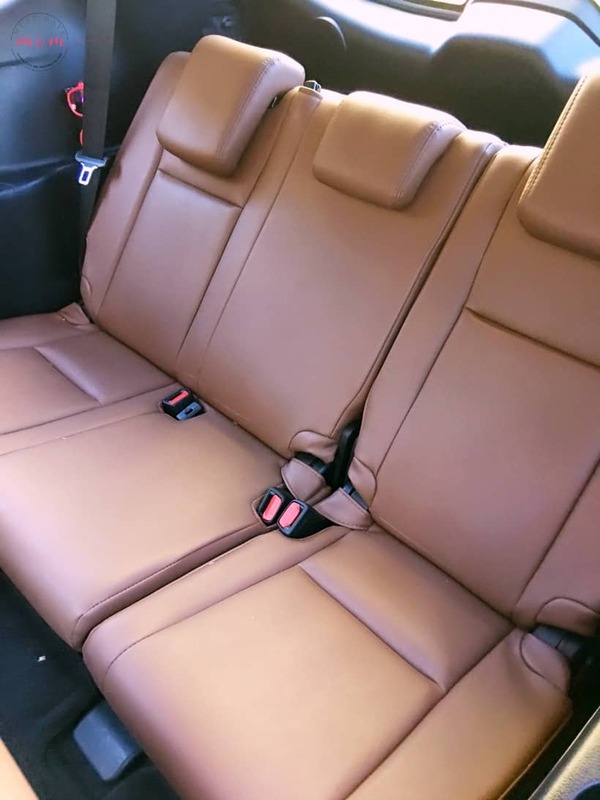 At first glance, the Toyota Highlander offers a gorgeous interior with comfortable seats and roomy seating for up to 8 passengers. 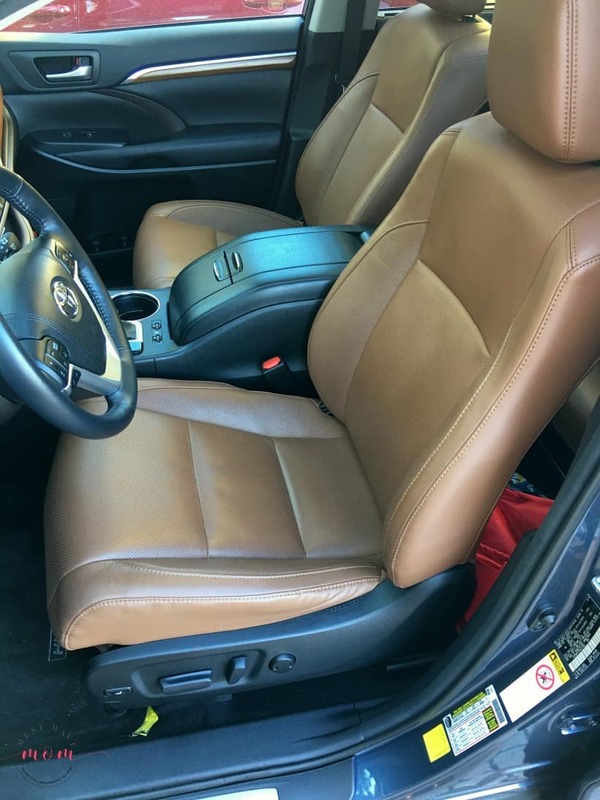 The interior is luxurious, while still being functional for families. The Highlander offers three-row seating and up to 158.7 cu. ft. total cabin volume. A one-step second-row sliding seat function on both driver and passenger sides makes entering the third-row easy. Third-row passengers even get a standard recline function. If the kids are in the third row and you need to tell them to keep their hands off their brother, simply use the Driver Easy Speak. A microphone located in the overhead console amplifies the driver’s voice and broadcasts it, one-way, through the audio system’s rear speakers. That’s right moms and dads, no more need to yell to the back seat. Save your voice for later. 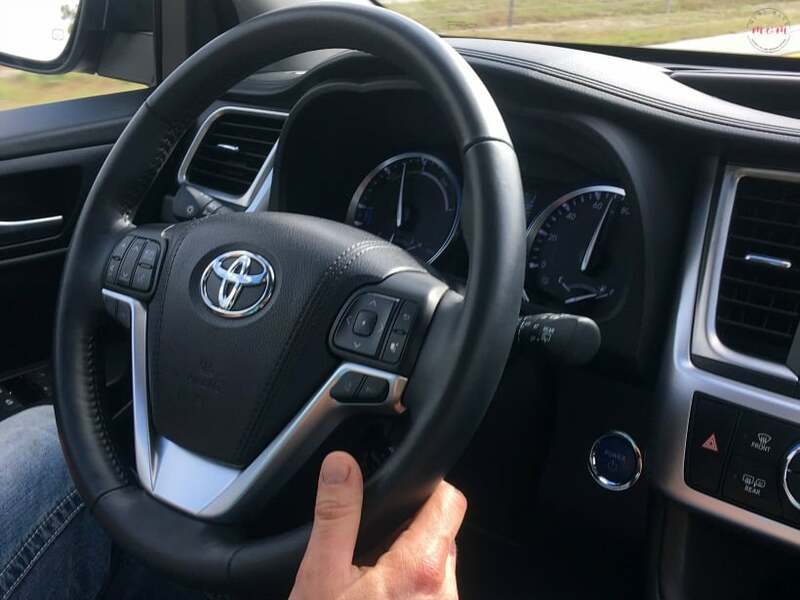 Perhaps one of my favorite features is the standard Toyota Safety Sense™ P driver assist system bundles cutting-edge active safety technologies. This driver assist system bundle includes Pre-Collision with Pedestrian Detection function featuring forward collision warning and Automatic Emergency Braking, Lane Departure Alert with Steering Assist function, Automatic High Beams, and Dynamic Radar Cruise Control. What does that mean? It means if I start to drift out of my lane the vehicle will correct and put me back in my lane. If I get too close to the vehicle in front of me it will automatically apply the brake and keep me a set distance back. It will even turn my brights on and off for oncoming traffic. It’s quite impressive. I felt a bit like the Jetsons in my smart vehicle that does just about everything but drive for me. This puts it high on my “best family SUV” list. The dash is a sleek and impressive looking design. I like the long cubby area that gives plenty of room to store devices, keys, parking passes and the like. Or if you’re a mom it may house binkies, teething rings and wet wipes. Let’s keep it real moms. The instrument panel is a plethora of information and I love the easy to read dials. 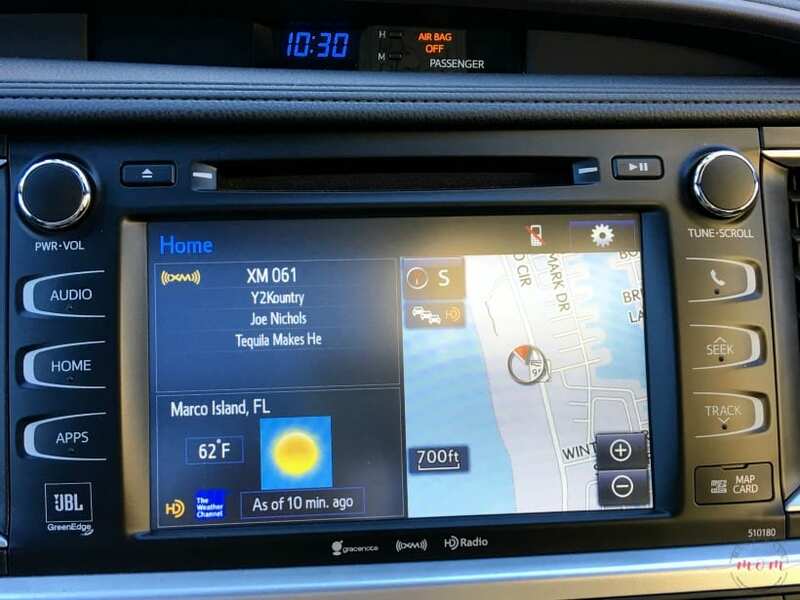 My favorite feature is the navigation system which hosts all sorts of features and information. 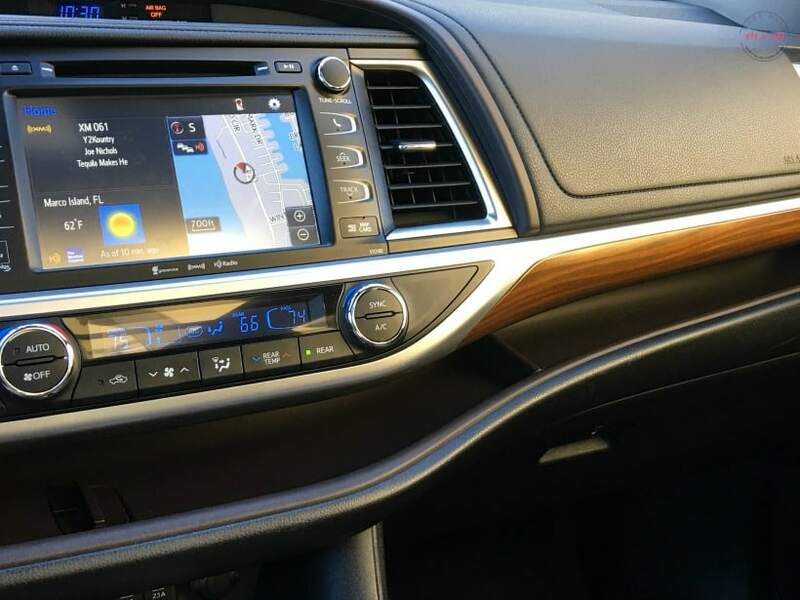 Since we were traveling while we tested out the Toyota Highlander, it was especially invaluable to have easy access to navigation that got us from point A to point B without any issues. The one time we thought we knew where we were going and got ourselves lost, it easily got us back on track to our resort. 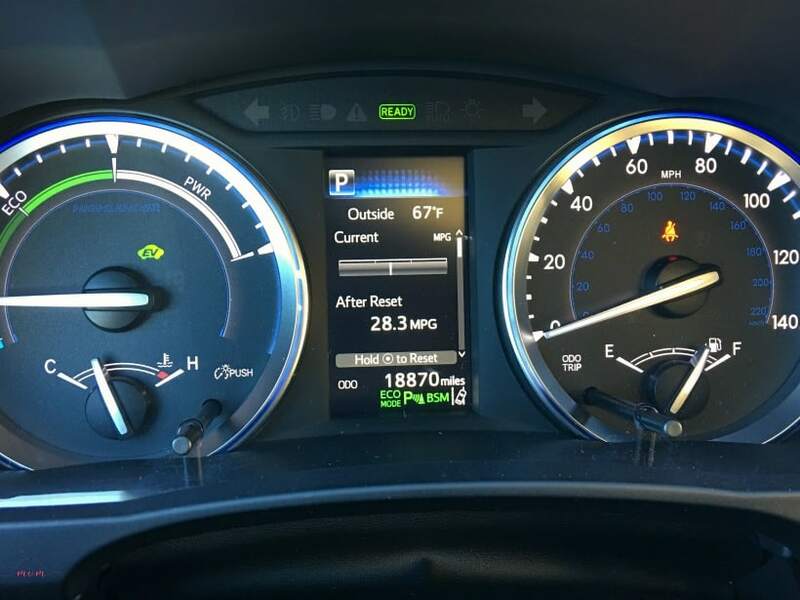 It features The Weather Channel temperature updates and SiriusXM® Satellite Radio. The heated and cooled seats were one of those little luxuries that everyone deserves to have. Being from northern Minnesota I typically have only used heated seats. Being in Florida, I quickly saw the value to having cooled seats as well! The driver and passenger can set them independently. Another feature that every family should look for in the best family SUV is a backup camera. I can’t tell you how freaked out I get about accidentally backing over a child or animal. The Toyota Highlander has the coolest ever camera options. 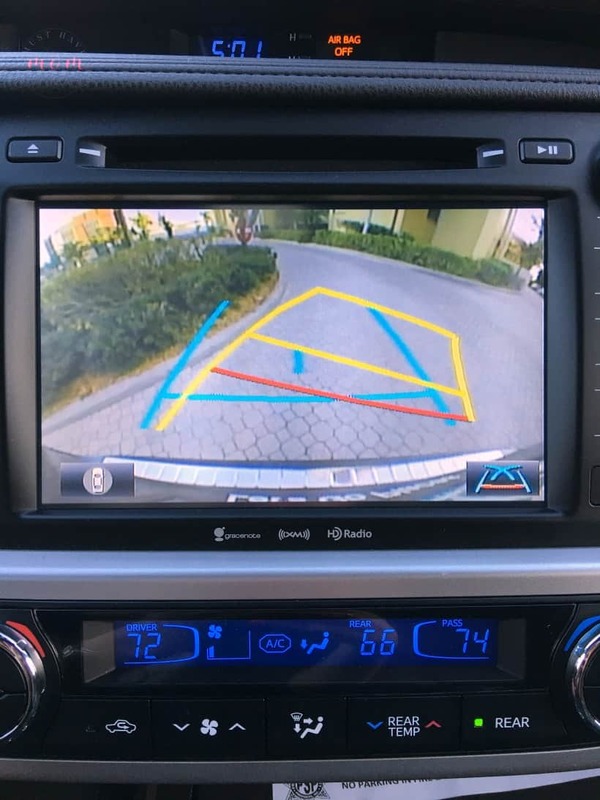 You can use the backup camera to easily back out of spots and see behind you, but you can also get a 360 degree look around the entire vehicle to ensure there aren’t any kiddos hiding in a blind spot. It’s amazing and life-saving. Perhaps one of the most impressive new innovations is the Stop and Start Engine System. 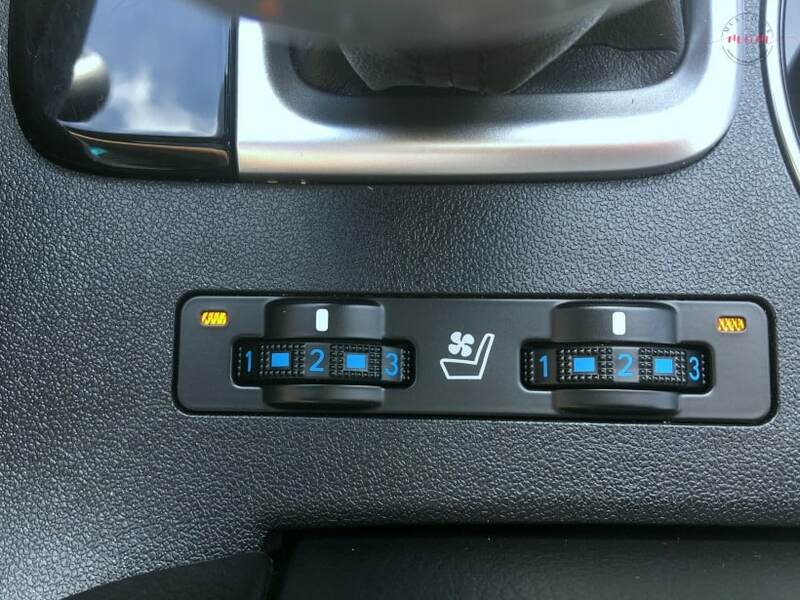 This new system allows the engine to shut off when the vehicle comes to a complete stop, and then restarts when the driver’s foot lifts from the brake pedal. Stop and Start is designed to reduce emissions, help reduce fuel consumption, and provide a quieter in-cabin experience for passengers when the vehicle is at a complete stop. I’ve saved the MOST impressive fact for last. Here is my family (minus my hubby who is taking the photo) and we fit ALL of us AND our luggage in the Toyota Highlander. That’s right all six of us, 6 backpacks and two enormous suitcases fit in the Highlander. I was shocked that this midsize SUV could pack us all in. We are quite a crew. All in all, the Toyota Highlander is where luxury, safety and performance collide to create the best family SUV. Got questions? Leave them in the comments or join us on Facebook to chat! 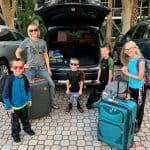 Want to know how we afford to travel with four kids in tow? 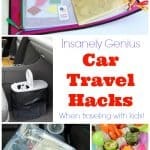 Check out my post here on using rewards to get free travel for your whole family! What a great looking car! I love the idea of the backup camera. Looks like you all were able to fit in there too with plenty of room. We are totally a Toyota family! I love the RAV4 but have not driven the Highlander yet. That may be my next test drive! This looks like the perfect road trip vehicle for my family of 5. I need to request one when we go on vacation this year. It looks like a great vehicle for road trips1 Love how spacious it is! I have always loved Toyotas- such great, reliable cars! What a great looking vehicle! I love that it seats 8! My family would fit great in it. Looks like you had an amazing time! It really is amazing what a difference a great, reliable vehicle with great features does in making the difference on road trips! We test drove a Highlander and absolutely love it! My only concern is that when my 9-year-old daughter sits in the middle row, her eye level is below the window. 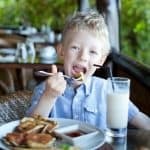 Did you notice that with your children, and if so, was it a problem for them? Hmm I didn’t notice that with my children. Perhaps you could try a backless booster seat for her? I’m not sure how big/small she is. How was the rear climate control for the kiddos? I always feel like my daughter is roasting in her carseat because no air blows on her! My kids were very comfortable despite the hot outdoor temps!